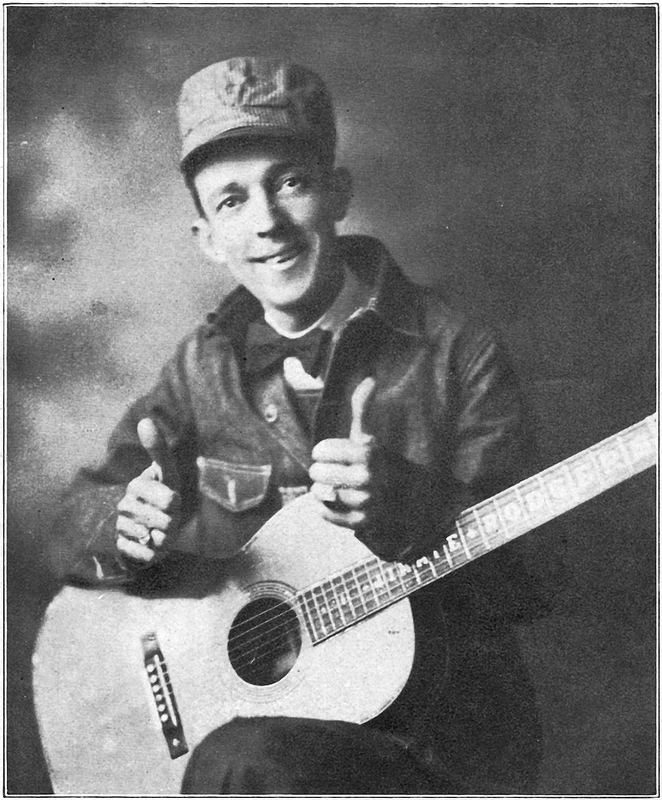 “Thumbs Up—On the Spot.” Jimmie Rodgers donning his brakeman attire for a famous studio pose. Circa 1930. This is the first Jimmie Rodgers record I ever owned, I picked it up at a little record store down in Austin that unfortunately no longer bothers stocking 78s. I hadn’t been collecting for long at the time—mostly I just had a bunch of records inherited from my great-great-grandfather and some junk from used bookstores—and that was one of my first forays into record stores to look for 78s. My musical knowledge wasn’t so vast then, but I’d heard Jimmie’s “Blue Yodel No. 8 (Mule Skinner Blues)” and I wanted to find a copy of that one. When I picked up this one, I couldn’t really recall which number of Blue Yodel that one was, and I hoped this one might’ve been it. I took it to the listening station in the store, and it wasn’t, but that was okay, it was only $3.99, and I wanted it anyway. When I got home, I listened to it over and over and—though the sound was a little rough, especially on the cheap equipment I had at the time—I fell in love with both sides just the same as I had with “Mule Skinner Blues”, and so began my quest to find more. Since my original posting of this record, I’ve come into possession of a considerably cleaner copy (about an “E-” as opposed to my original “V”, for those versed in the VJM record grading system), so I’ve replaced the transfers and label scans accordingly. Victor 21291 was recorded in Camden, New Jersey on February 15 and 14, 1928, respectively. It was issued that June and remained in the catalog until 1936. Jimmie Rodgers is accompanied by his own guitar, and by Ellsworth T. Cozzens on steel guitar on the “A” side and on ukulele on “B”. On the “A” side, Jimmie sings the second installment in his Blue Yodel series, “Blue Yodel No. II (My Lovin’ Gal, Lucille)”. I’d argue it’s one of his best, but then, aren’t they all? Blue Yodel No. 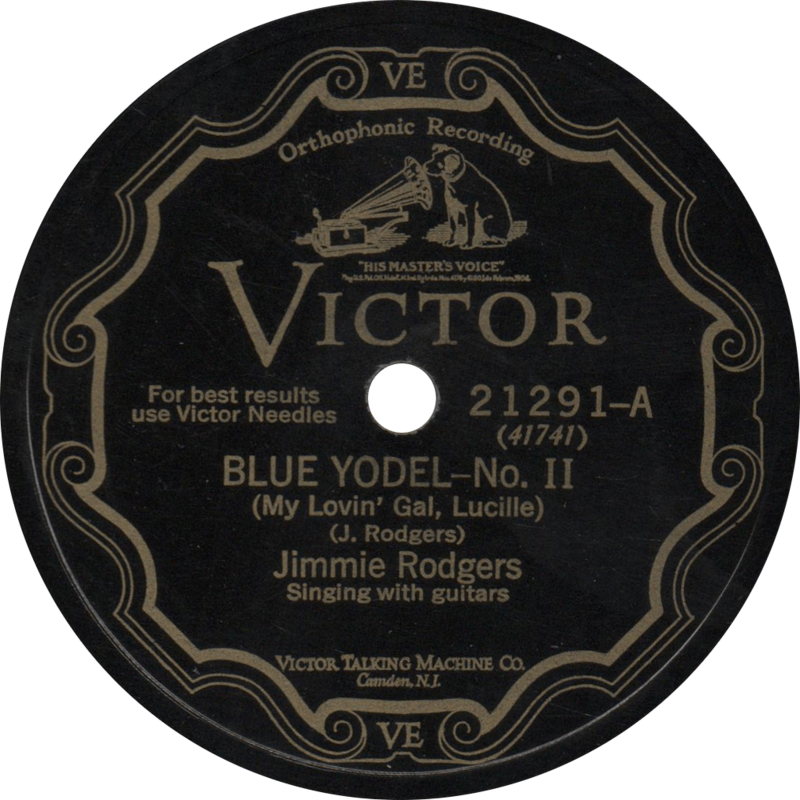 II (My Lovin’ Gal, Lucille), recorded February 15, 1928 by Jimmie Rodgers. 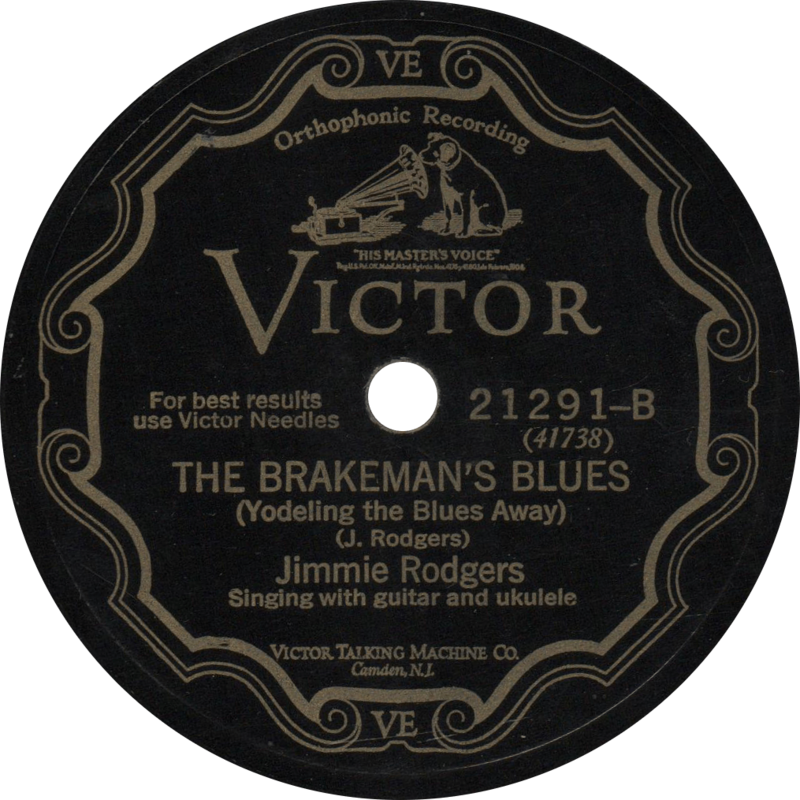 On the “B” side is another of Singing Brakeman’s classics, his eponymous “The Brakeman’s Blues (Yodeling the Blues Away)”. The Brakeman’s Blues (Yodeling the Blues Away), recorded February 14, 1928 by Jimmie Rodgers. Updated on October 28, 2017. This entry was posted in Records and tagged 1920s, 1928, Camden, Ellsworth T. Cozzens, Hillbilly, Jimmie Rodgers, Singing with Guitar, Victor by R. Connor Montgomery. Bookmark the permalink. Hi Conner, I’d rather enjoy Jimmie Rodgers on an original 78rpm than a CD anyday, Never Heard the Blue Yodel no. 2 with the Lucille reference. Nice find in the thrift shop, Wasn’t that a Jug Blower on this record as well for the Bass ? Ah, The Brakeman Blues, the songs of the railroad are always an adventure on the rails. Thank you, Byron. I couldn’t agree more regarding 78s versus CDs. I don’t believe there’s a jug on this one, but the steel guitar in the background does rather sound like one at times. To my knowledge, Jimmie’s only side to include a jug is “My Good Gal’s Gone” with Earl McDonald’s Louisville Jug Band.